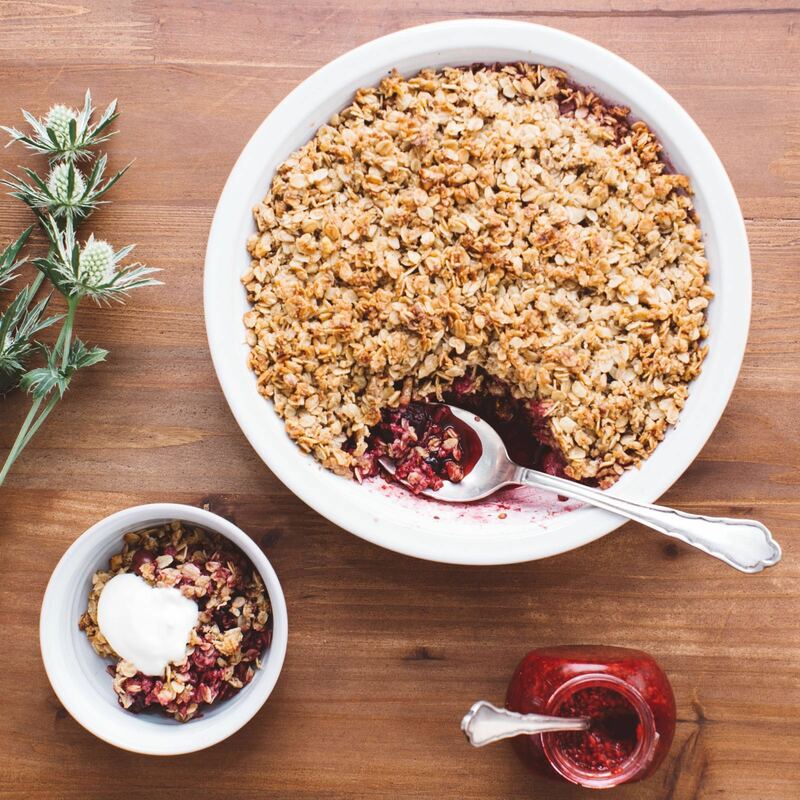 I love, love, love this crumble. I love it for dessert and I love the leftovers for breakfast. Did I mention I love it yet? I like that it is versatile in the sense that you can use any fruit that is in season and it will always be delicious. If you make it, post a photo and tag me- I want to see! 4 cups of fruit. See note below for what fruit to use. 3/4 cup brown rice syrup, honey or maple syrup. 1/2-1 cup chopped nuts of your choice. I like using walnuts, pecans, or almonds. Preheat the over to 175C/ 350F. In a large bowl, add your fruit, coconut water, lemon juice, vanilla and salt. Stir well to combine. Place your fruit in a glass or ceramic dish or baking tin and spread evenly. To make the topping, add the oats, flour, salt, nuts and cinnamon to a large pan and toast over low heat for about 4 minutes until you can start to smell the nuts and oats toasting. Keep stirring so it doesn't burn. In a separate small pan, combine the olive oil and sweetener of choice. Over low heat stir the oil and sweetener together to combine. Add oil mixture to pan of oats and mix well to coat oats completely to form the crumble topping. Spread this crumble topping on top of your dish of fruit. Cover the dish with foil and bake for 30 minutes. Uncover and bake for another 15 mins or so, until the top is golden and the fruit filling is bubbling up the sides a little. Remove from oven, take off foil and let cool slightly before eating. What kind of fruit can you use? You can use whatever is in season and mix and match. Some ideas- use 2 cups of each kind of fruit or more of one and less of the other- you can't go wrong. When I use berries, I use frozen berries because they create a nice juicy fruity base. If you don't use any frozen berries in the base, I like to add 1/2 a cup of liquid to the fruit base like coconut water or fresh squeezed apple juice.